Advance Keylogger Software specifically designed to monitor and record entire computer activities while you are way. Fast and reliable PC monitoring tool records all typed keystrokes, clipboard content, accessed application, system startup time, voice chat conversations and captures windows screen shots periodically at regular interval of time. Professional Computer spy utility saves all the computer details in encrypted log file with option to send log file to user specified email address or upload via FTP server setting. Key logger application runs in hidden mode and invisible in Start menu, Add/Remove program file, Task manager and even remains hidden from installation files and folders. The software is useful for Home user, Office manager, Parents, Network administrator, PC owner and other small and medium size organizations. • Fully capable to record computer and internet activities on PC in your absence. • Records internet activities including visited website, cookies, temp files with option to export entire details in excel file format. • Keylogger save all the details in encrypted log file and send to user specified email address or upload log file via FTP server setting. 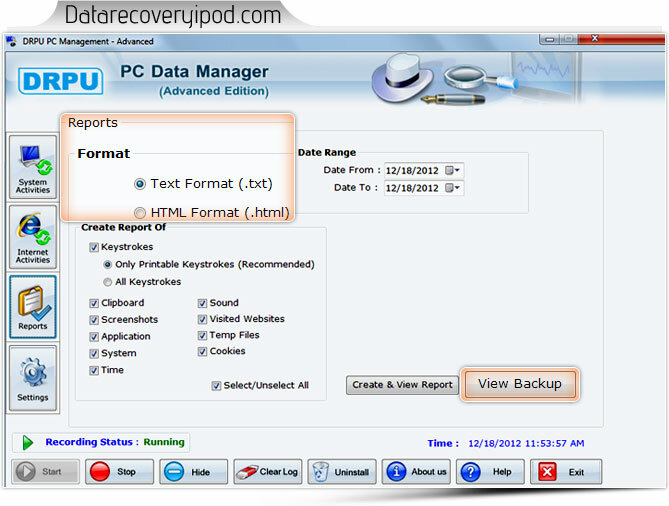 • Facilitate to generate reports of recorded data in txt or html file format. • Software easily overrides all major anti keylogger and spy tools. • Facilitate to set hot key or run command to access Keylogger application if runs in hidden mode. • Password protected facility to prevent unauthorized user to access or modify software configuration settings. • Provide attractive and interactive software GUI interface. • Easy to use for novice user and no prior technical skills or training is required to operate the software.